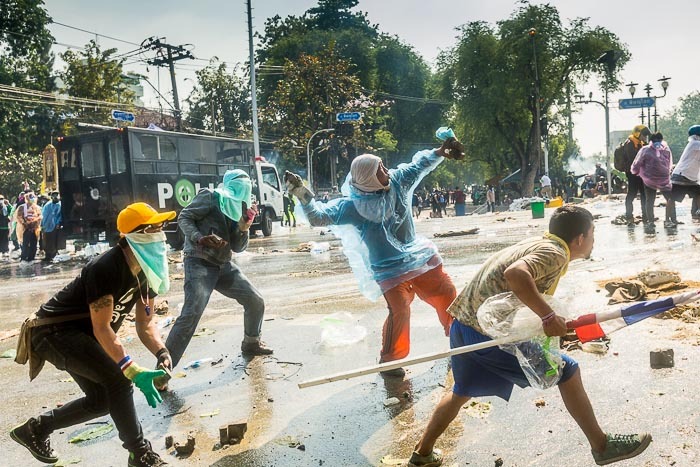 Anti-government protestors attack police positions on Phitsanulok Road with rocks. The violent, near riot like, protests that shook the Dusit district of Bangkok Sunday continued Monday. Although there weren't nearly as many protestors on the streets, they were a lot more determined and more willing to engage police. Police fired tear gas and used the water cannons throughout the morning. 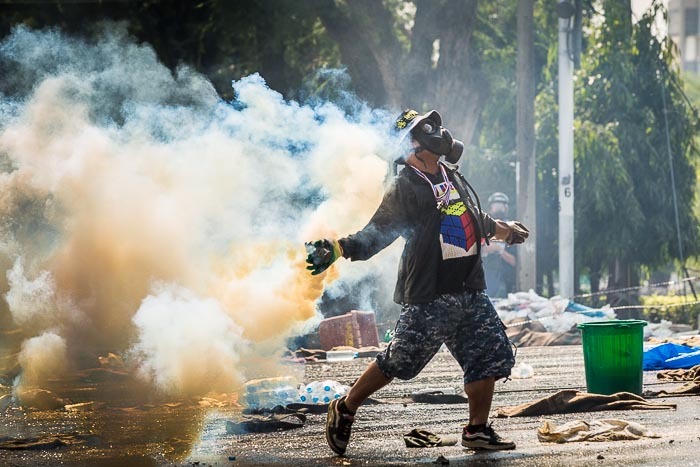 A protestor runs towards police lines with a smoking tear gas grenade. The police security perimeter was on the opposite side of a khlong (canal) that runs parallel to Rama V Road. Protestors ran up and down the road, using trees, cars, hedges and power poles for cover while they threw rocks, cherry bombs and fired slingshots into the police lines. The police responded by throwing rocks back at the protestors, throwing tear gas grenades and firing rubber bullets. The water cannons were set up at the intersections and bridges across the khlong and used to sweep protestors out of the street when they approached the bridge in big numbers. A protestor fires his slingshot towards police lines. The skirmishes went on like this for hours. The protestors have shown remarkable ingenuity in finding ways to counter police tactics. They use wet burlap bags to smother tear gas grenades, rain ponchos the protect themselves from the caustic chemicals mixed into the water cannon, construction hard hats, motorcycle helmets or buckets to protect their heads from flying debris. Some used life preservers as body armor against rubber bullets. Many have their own gas masks, but vendors were selling industrial breathing filters on the streets leading up to the protest site to people who don't own gas masks. 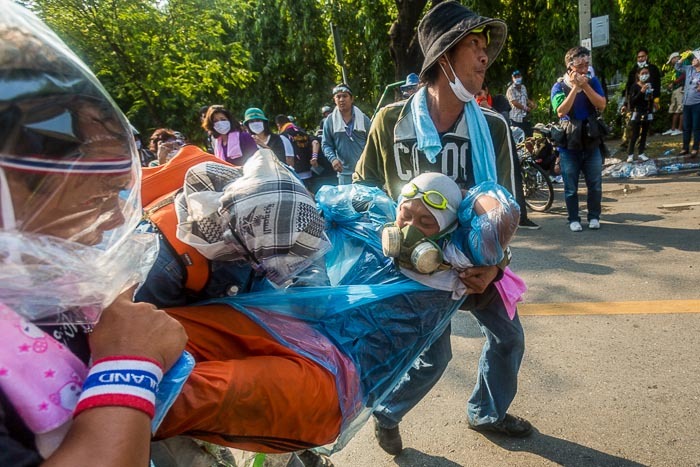 Some were using plastic bags over their heads to protect themselves from the gas, which I suppose will work for a minute or two or for however long you can hold your breath. Protestors, wearing all of their various protective gear rush one of their own, hit by a rubber bullet, to waiting medics. They even have a field hospital set up about 100 meters from the front line of the fighting. It was mostly serving people overcome by tear gas or the caustic chemicals in the water cannon. Ambulances and medics were on standby to rush more seriously injured people to hospitals. I was down at the "front" for about five hours. It sounds weird, but the protestors were always very nice to me. They knew I was photographing them but they didn't interfere with my work. I went to the field hospital for ear plugs and they offered me not only ear plugs but also goggles, saline solution (for eye rinse), bottled water (for drinking) and gloves (to throw back gas grenades, which burn very hot). I declined everything but the earplugs. 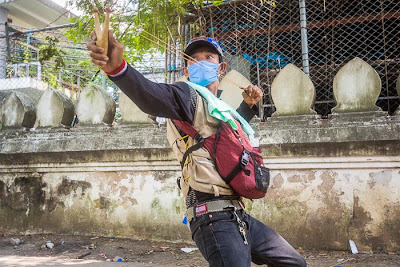 The Thai police are not using sonic weapons, but both sides have banks of loud speakers set up directly across from each other and play Thai music and trash talk each other at extraordinarily high volumes that is literally deafening. As the day went on though, I could sense the crowd's attitudes changing. They weren't achieving their goals and that frustrated them. I was by myself (which, frankly, is never a good idea in a situation like this) so as the afternoon wore on and after seeing a couple of protestors carried off with injuries from rubber bullets I decided to leave rather than stay as it got dark. I walked a couple of hundred meters to a group of waiting motorcycle taxis, grabbed one and went to the Skytrain and home. There are more photos of Monday's protest in my archive or available from ZUMA Press.